When we’re not dressed in our best glitter outfit, slurping Cosmos at NY Times Bestseller parties, authors are almost always found at home, drinking coffee, and dressed in their most holey PJs. Pyjamas are our work uniform, caffein is our lifeline. Someone once told me that readers are often found dressed like their favourite authors (in PJs), drinking their favourite author’s favourite drink (coffee, tea, or hot chocolate), while reading their favourite book. It’s high time to celebrate that! Welcome to the #AuthorsInPJs and #ReadersInPJs challenge! 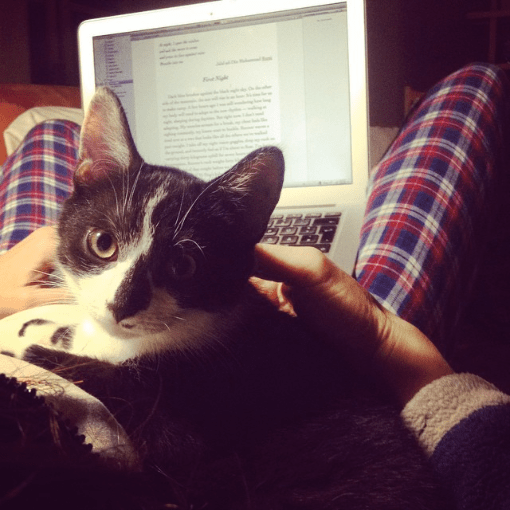 If you are an author: post a snapshot of yourself (wearing your PJs while writing or editing,) on your preferred social media site, and tell your readers (in a few words) what you did when you took that picture. Don’t forget to tag it with #AuthorsInPJs. Your readers love to see how the magic happens! If you are a reader: post a snapshot of yourself – wearing PJs while reading your favourite book – and tag it #ReadersInPJs to show what happens on the other end of our creative process. Show your love for your favourite author (who, most likely, wrote at least once in her/his PJs). We love to hear from you, because without you, we would be a sad bunch!